I get ill starting in the fall and through the winter and into early spring. Looks like this may be a permanent pattern (got some fun disorders, yee ha). So I just have to get my gardening done in the hottest part of the year now! It's not the easiest on the plants, but those that make it tend to be tough, heat tolerant little buggers, so perhaps it simply raises more desert awesome garden plants, in the end. I'm realizing some things about my gardening style. It's not tidy. It's not instantly pretty, or the type of garden that I plant so my yard looks lovely in the 'now.' I have seen gardens and yards like that and they can be awesome. They're just not for me. Or at least, not for the way I garden. My yard is, in some ways, the one in my head when I see what it'll look like years from now. One where I hope that things will quite frequently take care of themselves to a point that it doesn't need a lot of work from me. I want a place plants, animals and I can coexist a bit more than we did before I worked on it. I want a place where I can get food, and medicine, and a bit of peace and co-existing with my environment in a way that's difficult to do in modern America, nowadays. Doesn't mean I'm not changing my environment to make it easier for me, or better for me, or that I won't be competing with the animals for my food, and intending to win, too. But I really want to learn what Mother Nature is doing in my yard, and how things work, what is typically added in and lost during the year, so that I can keep things going as naturally as possible, where I can work WITH nature rather than constantly fighting her. I'm still learning plant names as a result, trying to find out where the plants grow, what eats them or uses them for a nursery or living space, what plants they grow with, and how that impacts how they grow and what their needs are. I've been checking out a great local plant nursery and getting some native plants I didn't even know existed, which feed either me, birds and insects, or the soil. Or they're medicinal, which I need as well. And even though it might not look amazing to other people, I'm happier and happier with it. I forgot to take a picture of the same angle, but this still shows some of the changes. First, I eliminated the pool equipment - converted our pool into a pond, actually, so that is all gone now. The rosemary, lemon verbena, and two types of lavender are doing great here. I add no soil amendments at all. I only water when stressed during the dry summer and fall, typically, maybe every once in a great while during winter for the same reason, but no regularly. 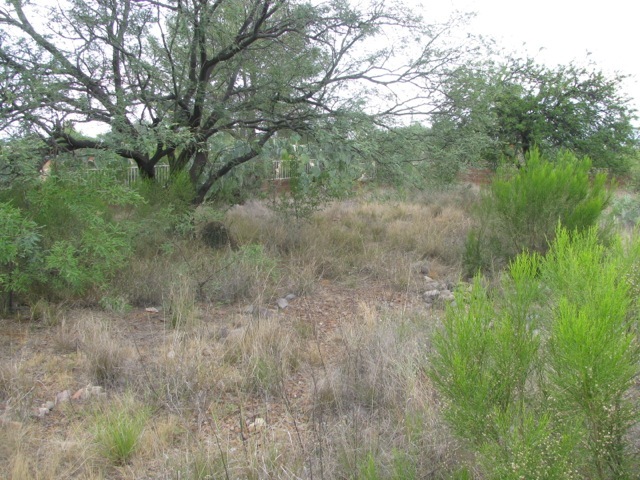 The area is within the roots of a mesquite, gets filtered shade from the mesquite at mid-day, a small bit of shade from the wall on the north side, and lots of leaf litter from the mesquite, as well, for it's own mulch - the mesquite is a legume, so it's adding in some nitrogen with the roots. It gets water from the rain gutter during rainstorms, usually only summer and winter monsoons, but it seems to do well with these. And for my happy moment - this is now 2 years after the lavender was planted and it's still doing great! I have planted a few things to the east of these plants but they never do too well, so I may need to find something that co-exists with them better, in this very hard dirt area. This is the herb garden from last year. 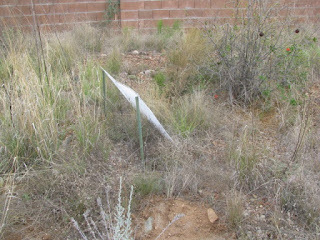 I finally had to abandon this herb garden. I did start having problems with the Mesquite roots turning upward and invading underneath the plants, so they had to have more and more water in order to survive, and it was just not working. I am going to try next year to see about plants that would grow more naturally underneath Mesquite without needing excess water, and shifting my herbs to other locations. Last time I was waiting for the fig tree to come in, and I finally got it in and got it planted. Tore up a whole bunch of brick to do so, as I wanted it in a position it would eventually provide some shade for the house, and also gets water from the roof gutter. It's got a little section set off on the right there where I tried to grow corn and squash. Corn didn't do so great, squash got eaten, sigh. In the back right, you might be able to make out a small, green plant. That is a bundle of strawberries from my mother's garden. She has a patch of strawberries that have been growing for 7 years now, and she gave me a few. 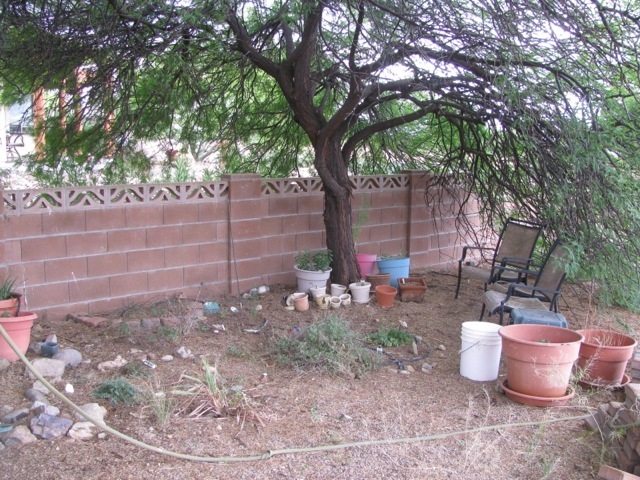 Some died, but this little bundle gets some shade overhead from the mesquite and seems to be quite happy. Some penstemons wild seeded here as well and can be seen here and there - they are biennial so they will bloom next year, not this. Otherwise, I'm letting some weeds grow to add a bit of shade here. 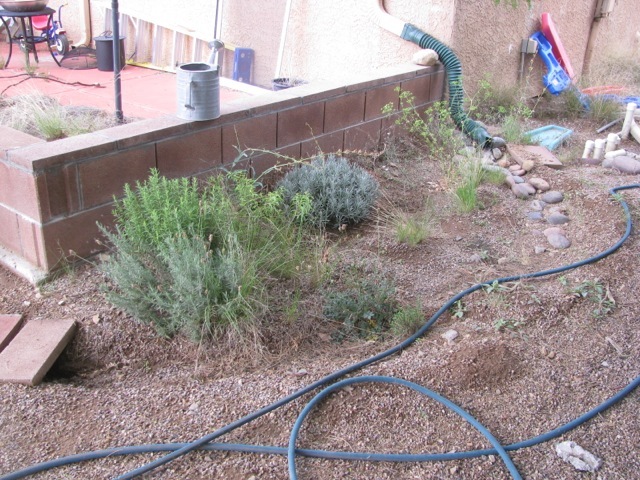 I'll be trying to add in some perennial plants along the way, I think, or annuals that reseed. I did it - turned the pool into a pond in May, 2014, and got it filled in June! It is 7 1/2 feet deep at the deepest, with the steps turned into terraced planters. The deep area I am hoping to make good for swimming. I bought or was able to get a few free plants so there are cattails, bacopa, lemon bacopa, eel grass (I'll have to get the botanical name so I can be accurate here), anachris, and tried to get the good type of duckweed (edible by humans as well as some animals) but it all got eaten, LOL. I have snails and a variety of insects already living in the pond, now. I bought 19 feeder goldfish, and only lost 2 in the first few days. Otherwise, the fish seemed very happy. I don't feed them and they live off the insects and plants in the pond. I'll have a whole photo montage of the pool up once I get it ready, and I'll link to it from here. There is no garden here anymore. Just too challenging to get it to work in this location, so perhaps I'll put up photos of the location eventually, but nothing going on here too exciting right now. 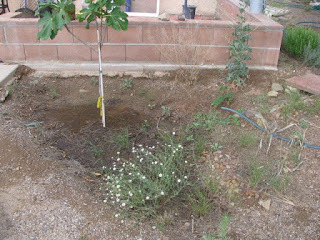 The chamomile only had a few pop up this year, and I haven't been watering the agave so they are not doing well. I wanted them to grow naturally without excess water, so if they make it, lovely, if not, it's not a good place for them. Perhaps I'll try to find another place, in that case. If you've seen some of my other pictures, you'll already know I added a zuni-style waffle garden around my pomegranate last year. It melted away during the monsoons, however, so this year, I've got a little more planted, in a sort of half-waffle garden, really. Something damage the pomegranate this year - a good quarter of it lost all its leaves, and all the fruit died later in the year before it ripened. I wasn't sure if it was going to make it or continue to go down (spoiler: it recovered!). The little bit of pale color at the front, a little left of center, is a mugwort that I planted and I'm hoping it will do well - it's a nice medicinal to have around. I am going to be trying to plant again in this location next year, likely a tree and maybe a garden, so we'll see how it goes. This year, however, I was sick so often, and so was my daughter, that gardening to a back seat for a long while. I let the weeds grow instead, which I don't actually view as a bad thing. I simply use the weeds as mulch later, or for composting, and they tend to soften up the ground a bit where they are, for later planting, so it's a win-win IMHO. A bit more overgrown than last time! As you can see - lots more growth. And I need to change the name: I let the almond tree die. Accidentally, as I was so ill I forgot to water it, but I think that it needing water so much, all year round, it's better that I don't have it. 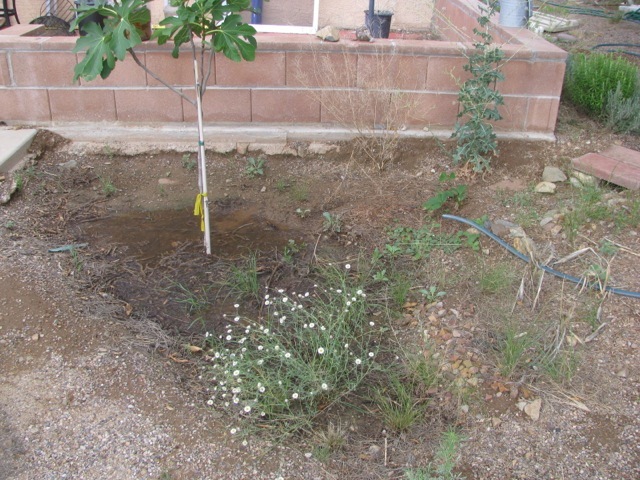 The volunteer netleaf hackberry tree under the mesquite is growing well, if slowly. 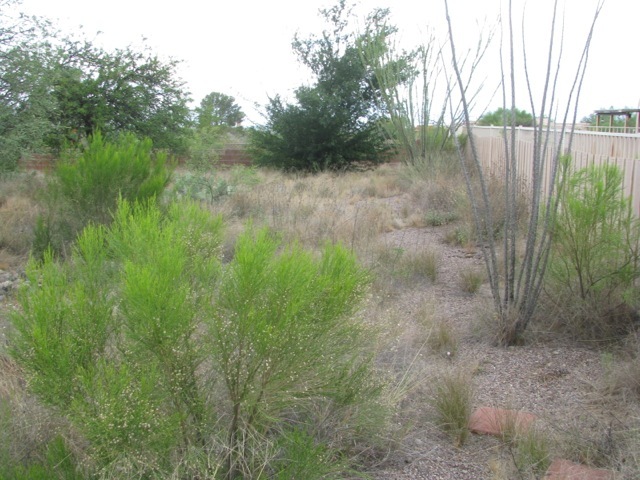 The bushes in bright green are called Desert Broom, and they get a bad rap out here. They grow well in disturbed soil, so they pop up a lot in people's gardens and the side of the road, so people even consider them invasive. However, in undisturbed soil, they don't grow well at all. And they are great for the insects around here - helpful to over 60 different species, in some way or another. They are also usable AS brooms. They grow quickly and can be a nice source for shade to add to the garden, if you can strap them onto something, and they are quite lovely when the butterflies swarm them at the right season. They also grow tall, at least 6 feet, in the right conditions, so can be nice shading plants for other plants that can't tolerate as much sun. This area is SO hot, that I am trying to let a lot of these grow here in an attempt to see if I can make the area an easier place to grow OTHER plants that I want to. Didn't really end up doing much in the summer here except spread around wildflower seeds, especially lupines, to help add nitrogen. The pale, dead plants you see near the grasses used to be a lovely carpet of pale lavender lupines, but by April, when this picture was taken, they have already died from the heat and spread their seeds. 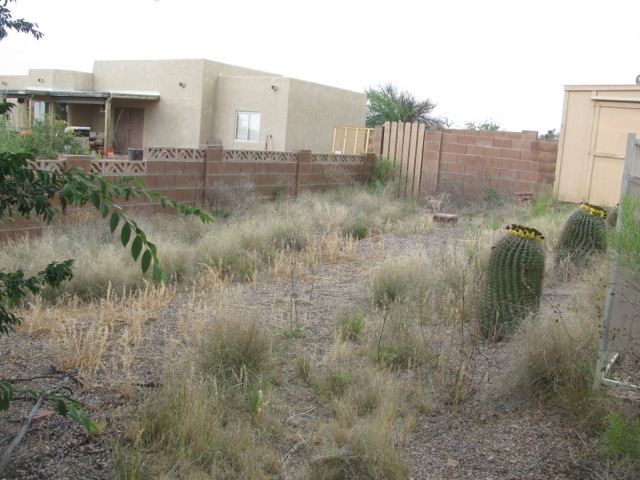 I'm putting this up a year late, and already have photos taken of the yard in May, 2016 now, too, so I'll at least get to put things up quickly now, to show the progress, and sometimes lack thereof.